Diamond-Blackfan Anaemia (DBA) is a blood disorder that stops the body producing red cells. The lifelong condition is so rare that it only affects around 125 people in the UK. Evie was diagnosed with DBA when she was just seven weeks old. Ever since then she’s needed blood transfusions every four weeks. She also has to carry an infusion pump to filter out the iron from her liver, which obviously interferes with normal life. Evie’s mum, Rebecca, says, "Evie gets quite frustrated sometimes that she can’t do what her friends or her little sister can do, as often as she would like to. She does have a ‘rest day’ on a Tuesday where she is free of the infusion pump, so we use this day to have a nice bath and to take her swimming while she doesn’t have the tubes connected. There is no cure for DBA, and treatment ranges from monthly blood transfusions to steroid therapy and in some cases a stem cell transplant. Evie is awaiting a stem cell transplant in March. Rebecca adds, "This transplant is going to change Evie’s life, but she will always have DBA because it cannot be cured. "Without blood transfusions Evie wouldn’t be here. I never thought about blood donation, or even knew anything about it until I was in the position where my child needed it to keep her alive. "When you are in a situation where your child needs something so vital to help them live, it really makes you think. You don’t realise how much it’s needed until it’s your child that needs it. 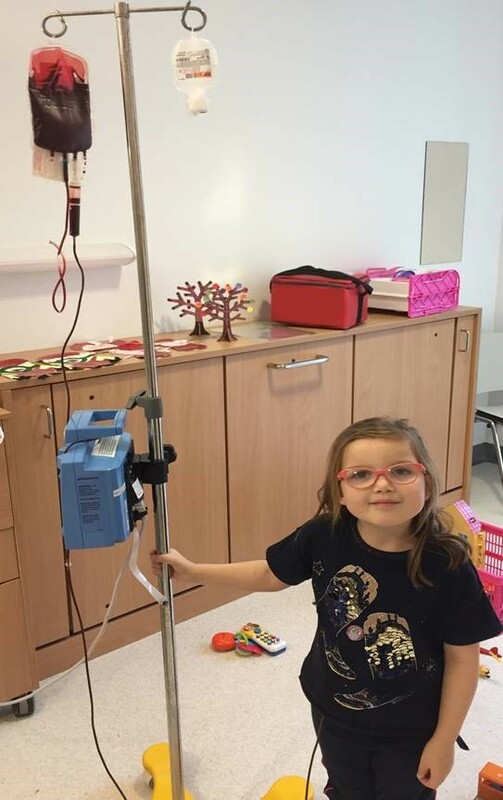 "I am so grateful to everyone who has donated blood so far to Evie, it really does make a difference." 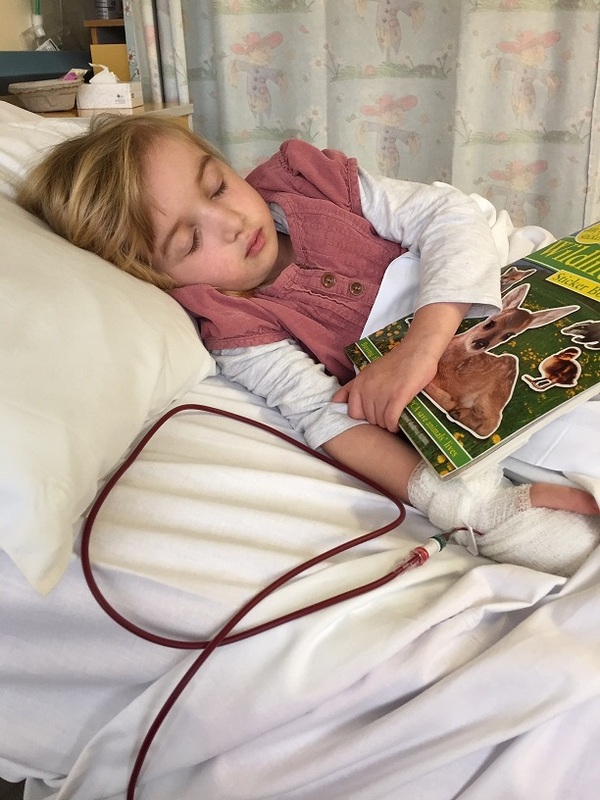 The ready availability of blood is something that Georgie Ashmore has appreciated ever since her daughter, Heidi, 6, was diagnosed with the same condition. She has spent much of her young life in and out of hospital, and has already received almost 50 units of blood. Georgie says, "When Heidi is due a transfusion she tells us that she has run out of blood and she is too tired to run anywhere. "Blood transfusions are a lifeline to her; once Heidi has received her blood she has so much more energy, can concentrate easier and feels like she can run again." Heidi has to go to hospital once a month for blood transfusions and is likely to need hundreds more in the future. Georgie doesn’t want Heidi to be worried about receiving blood and they see each unit as a gift and a reflection of human kindness. Georgie says, "To me, when Heidi has a blood transfusion, it’s like some amazing stranger has come along and is going to hold her hand for the next four weeks. "We are so grateful to everyone that gives blood. Heidi is a strong little girl – we call her small and mighty - but she is totally dependent on blood donors. "These amazing people are Heidi’s lifeline and we will never be able to find the words to fully express just how incredible grateful we are to each one of them."